For more than 30 years the school has resided at its current location, featuring our very own 3,200-square-foot building situated on several acres of serene, secluded woodland. Over the years, we have made many additions and improvements to our facilities, both inside and out, making them among the finest on Long Island. Our air-conditioned building houses five sunny, cheerful classrooms, each designed with a full complement of active learning centers – a literacy center, a sensory table, an art center, a building area, a discovery table, a dramatic play area, a classroom library and a media center. Twelve-foot ceilings and lots of windows provide a bright, expansive environment, ready to welcome the hustle and bustle of active learners. Cubby space, classroom sinks and lavatory facilities have all been specifically designed for young children to promote self-help skills and independence. A well-equipped kitchen is put to good use for several lovely school events, such as our Thanksgiving Feast and Spring Luncheons, and also facilitates regular hands-on cooking experiences for the children. Our Parent Resource Center and our Staff Resource Center house an extensive selection of informative materials on a wide range of topics related to early childhood development. 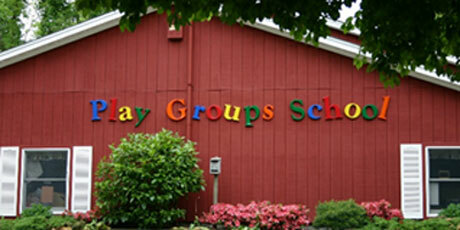 Beyond our school building is the Outdoor Classroom, set on a beautiful ½-acre and home to all of the same learning centers found in our indoor classrooms. The ODC boasts centers for nature art, building, messy materials and music and performance, as well as a water sluice, working gardens, a gathering area, climbing boulders and slide, a raised “bird’s nest” observation deck, riding track and, positioned high above to survey it all, an overlook. 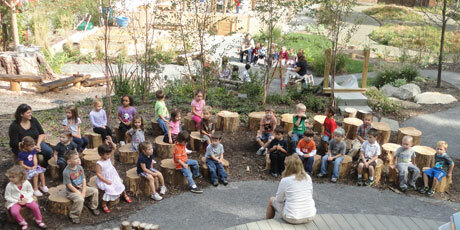 Completed in 2011, the ODC offers dynamic, nature-based play and meaningful learning experiences in a beautiful space. Two spacious playgrounds offer large-scale equipment for gross motor development and just plain fun – swings, slides, a curly climber and a suspension bridge. Our toddler playground is home to all the same equipment as the “big guys,” but scaled down to toddler size for safety and comfort. Adjacent to the main playground is our child-friendly pool for summer camp, specially designed for young children with a maximum depth of just over three feet and a capacity of just eighteen swimmers.